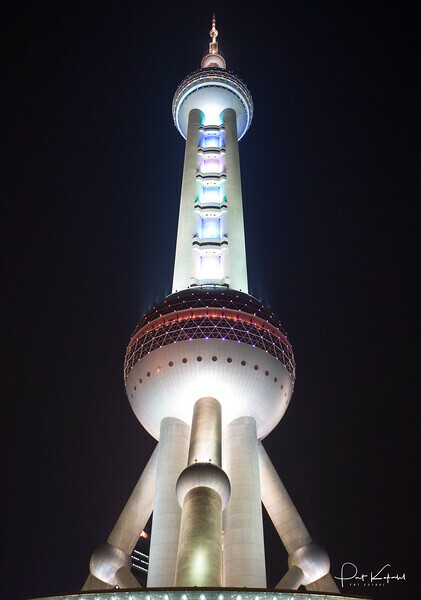 The Oriental Pearl Radio & TV Tower is in Shanghai, China. Its location at the tip of Lujiazui in the Pudong district by the side of Huangpu River, opposite The Bund, makes it a distinct landmark in the area. The tower has fifteen observatory levels. The project also contains exhibition facilities, restaurants and a shopping mall. There is also a 20-room hotel called the Space Hotel between the two large spheres. The upper observation platform has an outside area with a glass floor.